Google, Verizon and others are partnering with NASA on an Unmanned Aircraft System (UAS) traffic management scheme. Microsoft has been working with universities on drone-enabled mosquito traps in an effort to stall infectious diseases from spreading. Cisco has shown off drones whose cameras feed into the company’s collaboration technologies. And AT&T, IBM and Intel have all demonstrated advanced drone-based research. All of this activity by enterprise IT vendors in the commercial drone field is a far cry from what was being done -- or at least being publicly discussed -- back in late 2014, when our efforts to get such vendors to share their ambitions largely went unheeded. Not that you could blame the vendors for being gun-shy. After all, the legal landscape for commercial drones has been murky at best, with the Federal Aviation Administration scrambling to roll out rules designed to allow hobbyists and commercial enterprises to benefit from flying drones but also to prevent these devices from smashing into people, structures and airplanes. High profile drone-based delivery systems floated by the likes of Amazon and Google have already become cultural phenomena, but since late 2014, the FAA also has been granting so-called Section 333 exemptions to thousands of organizations seeking to experiment with or use drones for less publicized commercial purposes, such as aerial photography by realtors, surveillance by various entities and pipeline monitoring by energy companies. 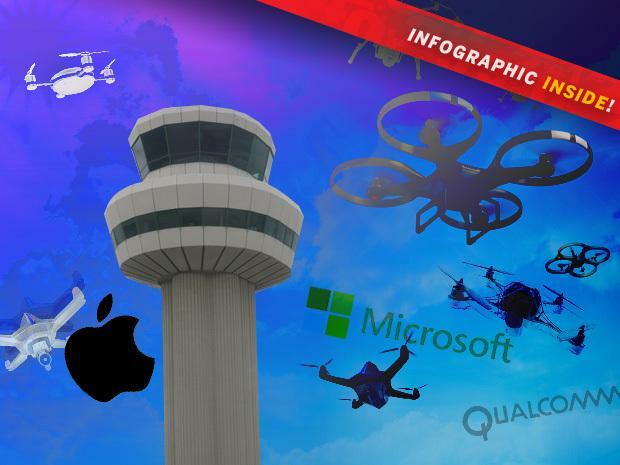 Among those nabbing exemptions have been enterprise tech companies such as Apple, Microsoft and Qualcomm, and numerous others have been able to employ drones via partners in the aviation field (see Infographic below for more data on this). It’s no wonder that enterprise IT vendors are seeking to get in on the action, even if that means not so much building drones themselves, but rather providing supporting technology, from network connectivity to network management to collaboration tools to big data analysis. Hundreds of millions of dollars are being pumped into drone-related startups, and the investment arms of companies such as Intel, Qualcomm and Verizon are among those leading the way (Drone companies like Airware and DJI are launching venture arms, too!). Market watcher Grand View Research says the global UAV market will be worth more than $2 billion by 2022. In other words, all the kinds of things that enterprise IT vendors specialize in now. Former Cisco CEO John Chambers’ recent investment in hot drone startup Airware recently grabbed headlines (“Cisco ‘s John Chambers toying with drones in “retirement”), but Cisco itself is up to much more than that. The company has been talking about the Internet of Everything for years now and is putting its money where its mouth is via moves such as the $1.4B buyout of IoT platform provider Jasper Technologies earlier this year. And drones fit right into this burgeoning networked world of sensor-based devices. While Microsoft declined to talk drones with us, and IBM, Dell and HPE never responded, Cisco had plenty to say. Much of what Cisco is thinking about drones can be gleaned from Biren Gandhi, a distinguished engineer and strategist in Cisco’s Corporate Strategic Innovation Group, who has been blogging about drones for the company over the past year and has been on the drone conference circuit as well. Gandhi spoke at the NASA UTM Convention and the Las Vegas InterDrone event last year, and is taking part in a couple of panels this week at the Association for Unmanned Vehicle Systems International’s Xponential 2016 show in New Orleans. Gandhi, who is excited about the possibilities of drones to do good, spoke to Network World last week about Cisco’s approach, which he emphasized “is not a concrete proposal – we have a hypothesis and series of beliefs, and so do other companies” (See: “Meet Cisco’s go-to guy on commercial drones”). Cisco’s Strategic Innovation Group focuses on evolving ideas that are 3 to 5 years out from really taking off and for which Cisco may not already have a business unit. Cisco sees numerous angles through which it might get involved in drones, including by partnering with outfits such as Dimension Data. The companies are working in South Africa to help a game reserve protect Rhinos from poachers in part by using infrared camera-equipped drones for surveillance. Gandhi says “the de facto play” for Cisco and others is in network infrastructure, providing drone operators with options regardless of where drones are flying. Whereas ad hoc Wi-Fi networks might be the cheapest and best way to control drones in some locales, pricy satellite might be the only choice in more remote places. Gandhi and a colleague have actually filed for a patent recently on a method for dynamically sorting all of this out. But Cisco also has demonstrated the use of collaboration and conferencing technologies, such as WebEx and Spark, for making on-the-fly use of drone camera video footage, and sees possibilities through fog computing for helping drone operators process data more efficiently than just dumping it all into the cloud – a process that can take days if you’re talking about really rich data. With the FAA focusing seriously on drone safety, vendors like AT&T and Intel are exploring how their technologies can help drone operators fly their devices beyond line of sight. AT&T and Intel are working together to enable live views of cameras and sensors on drones and to evaluate how the LTE network fares at higher altitudes, including for video streaming and transmitting telematics, Walsh says. “Use cases such as package deliveries, video streaming and emergency response will depend on drones being able to fly farther and longer safely, beyond visual line of sight and out of the way of other flight paths,” he says. AT&T isn’t interesting in supporting drones for just its customers either: UAVs could also be used to inspect some of the carrier’s network assets. Verizon too is serious about commercial drones. The company is working with NASA on its development of Unmanned Traffic Management solutions and investing through Verizon Ventures in startups such as PrecisionHawk, which provides aerial data and safety platforms for commercial drones, with an emphasis on users in the agriculture, insurance and telecom industries, and Skyward, which connects drones and their operators with the information they need to fly safely and in compliance with regulatory and insurance requirements. Geir Ramleth, who runs a small investment/consulting/advisory group called GeirHeads, concurs that carriers could play a role in how drones and their data are connected to enterprise networks. As for the Ciscos, Microsofts and others of the world, he thinks they could play a role on the back end, such as in supporting applications like asset surveying (as former SVP and CIO of Bechtel, he knows a thing or two about these sorts of operations). One possible role traditional IT players could play on the front end, though, is figuring out how to improve battery life and network transmission power for lightweight drones, Ramleth says. But with hundreds of millions of dollars being poured into drone startups and a traditionally acquisitive bunch of enterprise IT vendors hovering around the market now, it’s a good bet that some pretty familiar faces will wind up making their presence felt.